Gavi has historically been one of the favorite Italian white wines in America, but recently it seems to have been lost in the shuffle. Pinot Grigio has taken some of the business away and then there are just so many other wines out there a consumer can choose from, be it from Italy or a dozen other countries. I recently went to Piemonte to try the new vintages of Barolo and Barbaresco, but of course, I needed some white wine to balance out all that red. I tried some lovely bottlings of Arneis, but I kept coming back to Gavi for some pleasant surprises. Here is a report on three wines I enjoyed very much during my trip. Gavi #2 that impressed me was the 2010 Francesco Rinaldi. Yes, you read that right - the historic winery known for their traditional Barolos from the Brunate and Cannubi vineyards, has produced its first white wine. It so happens that their winemaker owns a vineyard in Gavi and decided to produce a wine under the Rinaldi label. This wine has appealing Bosc pear, lemon peel and lilac aromas, is medium-full and sports very good acidity and persistence. It will be an excellent choice over the next 2-3 years with asparagus, lighter chicken preparations or with most shellfish. 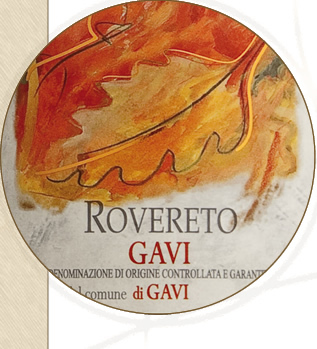 The Gavi that impressed me the most during my trip was the 2009 Rovereto from Michele Chiarlo. Chiarlo produces three different offerings of Gavi and I first tried this bottling about six years ago on a visit to the winery in the Asti province. I had tasted the regular bottling of Chiarlo Gavi on many occasions at home, so this was a revelation for me, as I had not sampled a Gavi with this sort of richness and complexity. The 2009 has those same qualities and is from an outstanding vintage. There are aromas of fresh Bosc pear along with quince and mango and there is excellent persistence. This Gavi has lovely texture and a lengthy, flavorful finish and is a step up from most bottlings of this wine type. I enjoyed it thoroughly with my tajarin with asparagus at one trattoria and with seafood at another ristorante. Unfortunately, this wine is not imported into the United States, so the only way most of us can try it is in Piemonte. Now you have another reason to go! Anyway, it's nice to see that Gavi is still a healthy, vibrant wine in Piemonte. Let's hope it regains some of its former sales success here in America. As my specialty in the wine business is reporting on the wines of Italy, I'm often asked to taste examples of California wines made with Italian varieties, so called Cal-Ital wines. Over the years, I've sampled some nice whites - primarily from Mendocino County - as well as a nicely crafted red or two from various zones in California (a Luna Sangiovese from more than a decade ago is a pleasant memory). But I can't say that any of them have greatly impressed me; yes, they've been pleasant and nicely balanced and in some cases, even displaying the lively acidity you expect from these varieties. But few of these wines have the structure or complexity of their Italian counterparts. I started to think that maybe it's just not possible to make notable wines from Italian varieties in California. After all, the conditions - from soil to climate - are radically different and let's face it, the growers are going to plant successful varieties such as Cabernet Sauvignon, Merlot, Pinot Noir and others in the finest sites; Italian varieties will often have to thrive in less than stellar conditions in California. But then I tried the wines of Palmina from Santa Barbara, which has me thinking, yes, it is possible to make beautifully crafted wines from Italian varieties in the Golden State. The brains behind Palmina is Steve Clifton, who is one-half of the Brewer-Clifton winery that produces brilliant Pinot Noirs and Chardonnays, primarily from small vineyards in the Sta. Rita Hills appellation (I'll post on these wines in the near future). Steve founded the operation in 1995 and named it after a dear friend who taught him all about the love and wonder that goes into Italian wine and food. Steve has clearly learned these lessons well, as his wines are as fine a collection of Cal-Ital wines as I've tried. I tasted the wines with Steve last week at a distributor tasting in Chicago and while I didn't try everything, I was very impressed with several of the wines. Regarding the whites, the clear winner for me was the 2009 Arneis. This variety yields a medium-bodied white with aromas of pear and pine and is generally made without any oak aging (or very little) in Piemonte. The Palmina is partially aged in neutral oak, so the perfumes are not hidden under the wood notes; also the wine has a slight touch of minerality and very good acidity (the Honea Vineyard in the Santa Ynez Valley from where this fruit is sourced, is influenced by fog, meaning cool temperatures and a long hangtime). This is a wine that will drink well over the next 2-3 years and would be fine with a variety of foods, from shellfish to roast chicken. 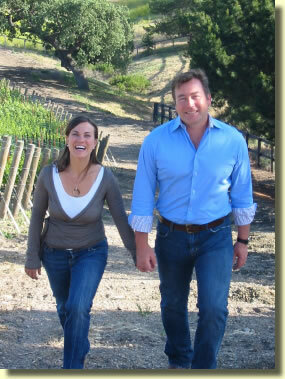 The 2009 Dolcetto, sourced from two Santa Barbara vineyards (one the Honea vineyard and the other the Zotovich vineyard in the Sta. Rita Hills AVA), has pleasant freshness with youthful black cherry and black raspberry fruit with good acidity. This has medium-weight tannins and is quite tasty; this is a Dolcetto with very fine typicity- you might think you were drinking an example from Piemonte. Enjoy this over the next 2-3 years with pizza or lighter pastas or red meats. The real surprise for me was the 2006 Nebbiolo. Now you have to understand that for me, Nebbiolo is almost sacred. Only in a few small zones in Piemonte - most notably Barolo and Barbaresco along with Gattinara - as well as the Valtellina district in northern Lombrdia - have historically displayed the proper conditions in which this variety can yield world class wines. So anyone who plants Nebbiolo in California has their work cut out for them (they may also need to have their heads examined, given the folly of such an adventure, but that's another story). The 2006 Palmina Nebbiolo was a wonderfully pleasant surprise for me then. The wine has the proper deep garnet color; that along with the dried cherry and cedar aromas told me that Clifton had properly aged the wine in large wooden casks. During the 1980s and 1990s, there was a movement in Piemonte to age Barolo in small oak barrels, as if to give the wine a more modern identity - one with more spice and perhaps a bit more flash, if only to influence certain wine critics. While a few producers made brilliant wines, too many of these wines for me were not what I wanted from Barolo. Tradition had been replaced in these wines by ripeness and power. So I clearly love traditional Nebbiolo and that is exactly what this Palmina wine is all about. Clifton aged the wine for three years in large wooden casks, ranging from 3500-7000 liters; producers in Barolo who use large casks work with sizes ranging from 3000-5000 liters). The wine is quite elegant, even with its youthful tannins and has very good acidity. This is a wine of balance and varietal character, not a wine of power or strength. Now I'd never mistake it for a cru Barolo or Barbaresco, but it is quite recognizable as Nebbiolo and it compares well with some examples of Nebbiolo d'Alba or Langhe Nebbiolo. I'm not sure I'd ever thought that was possible in California. But thanks to the dedicated work of Steve Clifton and his team at Palmina, Nebbiolo, Dolcetto, Arneis and a few other Italian varieties are performing beautifully in the New World. The key, like it is with the best Italian restaurants in America, is capturing the spirit of Italy. I can't wait to try some of the single vineyard Nebbiolos from Palmina. Nice work, Steve!